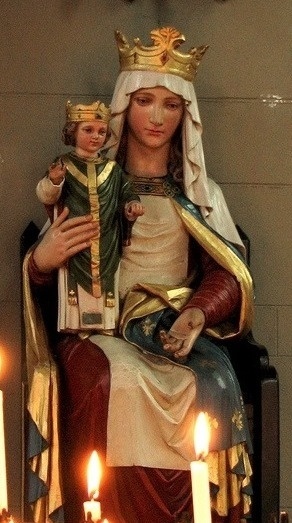 I have for years had an image of Our Lady of the Clergy, Notre-Dame du Clergé, on this blog. See the sidebar. Right now I have a special reason to ask her to stick by me and a few other priests I know. I think this image may be in Paris, but I don’t know where. What can you amazing people come up with? Often, if I ask a question, someone out there has the answer, or finds it. The writing on the card says that it was painted by J.M. Breton. It also says Procure Général which leads me to think that it may be in a mother house of an order, perhaps called after Our Lady of the Clergy, or something that has to do with Queen of Priests, etc. While I am in Paris, I’d like to see the original, if possible. This entry was posted in SESSIUNCULA and tagged Our Lady of the Clergy, Queen of the Clergy. Bookmark the permalink. 27 Responses to QUESTION FOR READERS: Our Lady of Clergy image – in Paris? 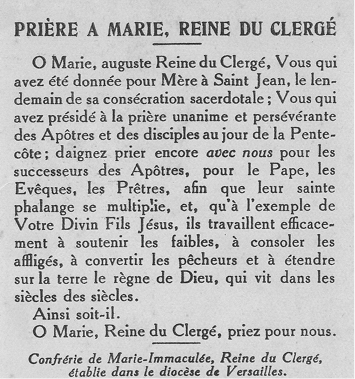 At the bottom, it mentions of the Confraternity of Mary Immaculate, Queen of Clergy established in Versailles. I found a Paris address (from 1937) at this site. FWIW the address is 32 rue de Babylone in 7e arrondissement. Current Google Street View looks residential. It appears that a book with the title Reine du Clerge was published in Paris in 1932 with the author Ignace Marie Freudenreich OFM. A copy is at the Bibliotheque interuniversitaire Sainte-Genevieve located across from the Pantheon. 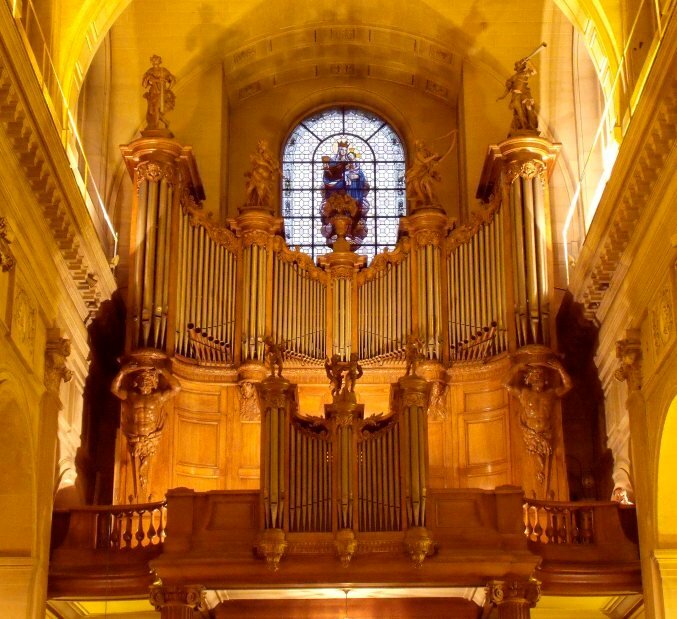 It appears a chapter of the Confraternity of Our Lady, Queen of Clergy was founded on February 2, 1908 at the Church of Saint-Nicolas du Chardonnet (23, rue Bernardine, 75005 Paris). This church however is now occupied by the SSPX. The readers of this blog are truly amazing. Even locating the order is not necessarily going to tell you where the original is, or if there IS an original. The artist appears to have produced images for multiple holy cards. See here. The images may not have been copied from full-sized paintings; they may have been small-scale pen-and-ink or pencil images produced just for the cards. “J.M. Breton” is puzzling: J. Breton would evoke Jules Breton, the French agrarian realist master of the second half of the 19th century, but his middle initial was not “M,” and these do not, frankly, look like his work. The name shows up as an illustrator in some late-nineteenth-century books and on other holy cards, but that’s about it in terms of the internet. I’ll be astonished if this turns up. The first two links given above refer to Quebec in Canada – a long way from Paris! I have a collection of old French images pieuses ‘rescued’ over the years from fleamarkets there and it would appear that illustrations did not necessarily mean that the images shown were in any particular diocese mentioned on the card so the reference to the diocese of Versailles may not mean that the picture illustrated is in that particular diocese at all. The Rue de Babylone is only a stone’s throw away from the chapel in the Rue du Bac but as Gregg the Obscure says it is residential and I seem to remember some building work going on there behind hoardings the last time I was there. Perhaps one of the Priests or Nuns in the chapel may be able to throw a light on the painting depicted. Have you tried Seminaire Saint Sulpice? 6, rue du regard, 75006 Paris. Sometime ago, a blogger posted your card on her site. She then found a beautiful prayer to Our Lady of the Clergy. J.M. Breton was still alive in 1950 and painted this chapel painting of the Nativity. It’s pretty far away from Paris, though, up in Savoie. They apparently have a ton of chapels there. Oh, so many book illustrations by J.M. Breton, but nobody seems to have any info about him/her. Probably in books about famous illustrators, but I don’t know anything about French bibliophiles or illustration art fans, so I don’t know where to look. A whole bunch of illustrations from a French history book for kids. Can anyone translate the prayer on the back of the holy card that Fr. G posted? I would be interested to read it, in English that is. :-) Thanks! the original (and takes photos for us). Ooh, ooh! SF connection! J.M. Breton illustrated one of the French editions of Arnould Galopin’s Le Docteur Omega, the 1906 French forerunner to Doctor Who! El Santo de Cada Dia. Picture excerpts from a Spanish 1962 version of a French saint book, illustrated by J.M. Breton and pictures signed JMB. O Mary, inspiring Queen of the Clergy, who wast given as a Mother to Saint John on the morrow of his priestly ordination, and who didst join with the Apostles in persevering prayer on the day of Pentecost; deign, we beseech thee, to pray with us for the successors of the Apostles: for the Pope, for all Bishops and all priests; that their sacred ranks may be multiplied, and that, after the example of thy Son Jesus, they may labor successfully to support the weak, to comfort the afflicted, to convert sinners and to spread on earth the Kingdom of God, Who liveth and reigneth forever and ever. AMEN. excalibur and St. Epaphras: Gratia Plena, how good you all are! God bless! Jesus crucifié est avec vous. The page also gathers quotes from other sources. La Procure est une chaîne de librairies, créée en 1898 à Arras par l’abbé Henri Delépine, installée dans ses locaux du 3 rue de Mézières à Paris depuis 19191,2. Son objet social était d’éditer et de diffuser de la musique sacrée, de commercialiser le livre et tout autre objet au service des paroisses. En 1934, l’entreprise se transforme en société anonyme et devient La Procure Générale du Clergé des missions et des œuvres catholiques. C’est en 1975, au moment où l’héritière cède La Procure aux Publications de La Vie catholique, Que. l’entreprise change de nom pour devenir « La Procure » tout court. La Procure est aujourd’hui une des plus importantes librairies religieuses d’Europe. Reconnue depuis longtemps pour sa spécialité dans le domaine des religions, c’est aussi une librairie généraliste et universitaire, à laquelle sont affiliés 26 établissements juridiquement indépendants, en France, en Suisse et en Italie. Elle dispose également de trois points de vente annexes à Paris (dont un ouvert en 2008 au collège des Bernardins), et d’un site consacré à la vente par correspondance installé à Chantilly2,3. So, has the image been located?